Apple revealed their latest flagship iPhone 7 this month & to lure Indian users, Airtel & Jio are offering great deals on its purchase. 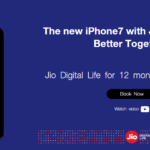 What is Jio iPhone offer? So, as if you are buying brand new iPhone device which is listed above then you will be qualified for jio offer. Till 31st December 2016, unlike other users you will be entitled for ‘welcome offer’ where you will get 4GB data per day & unlimited free voice calls. After 1st January 2017 till next 12 months, you will be given following benefits which are worth 12,000 Rs. Free calling to any network in India. Free 40 GB JioNet hotspot per month which you can use in public Jio wifi network. Unlimited local & national sms. You will get 15,000 Rs worth coupons which can be redeemed at Reliance retails stores. 10% discount coupon valid on 2nd order. Valid only in Delhi NCR, Ahmadabad, Bangalore & Mumbai. Benefits will be given post 1 January 2017. Unlimited 4G night data will be valid between 2AM to 5AM. Head over to this link & click on ‘book now’ button.